Kill Shot by Vince Flynn, a Mysterious Review. Review: After a year of completing assignments flawlessly, CIA agent Mitch Rapp has received the attention of governments worldwide … even if they don't know who he is. 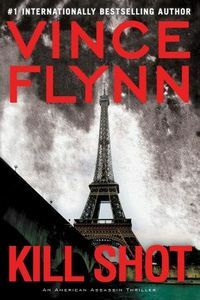 But an assignment in Paris that goes very wrong with the death of three civilians is causing the CIA — and Rapp himself — to take a closer look at how ready he is for the world of covert operations in Kill Shot, a sequel to the prequel … in other words, the second in the series chronologically but the twelfth overall … by Vince Flynn. Rapp is in Paris with orders to kill the Libyan oil minister. His advance team has done their job in providing the necessary intelligence, but he's on his own the night he selects to do his job. Moments after he puts two bullets — his signature kill shot — into the minister's head, a Libyan security team opens fire on him. Rapp manages to kill all of the team but one and to escape with only an injury to his shoulder, but in his post-assignment analysis he begins to wonder if someone — maybe even someone he implicitly trusts — has set him up. Kill Shot starts strong but then settles into a long stretch — indeed, most of the rest of the book — where very little of consequence or substance happens. The narrative alternates between Rapp meeting up with his girlfriend and recovering from his injury, his handler and other officials in Washington discussing what to do about him while publicly and privately denying having authorized the mission, and the French police investigating the crime and trying to reconstruct exactly what happened as they race to cover up their own illicit involvement. The pace picks up a bit towards the end as Rapp devises, then carries out, his plan to take out those responsible but ends rather abruptly with him taking off to lie low for a while. "He'd be back if they'd have him. He wasn't like other people and he never would be. They had changed him forever." But of course everyone knows that, since there are 10 other books that precede this one describing more of his adventures subsequent to this one. One might suspect that, with its relatively narrow focus, Kill Shot was written with a future adapted screenplay in mind. Starting the series over, from a chronological perspective, might provide studios with more opportunities in developing Mitch Rapp as a franchise character. But it does little to keep readers invested in the character or the series. Acknowledgment: Simon & Schuster provided a copy of Kill Shot for this review.